Russian couple came for getting married in Antalya by means of international wedding operator Wedding City Antalya company which organizes global trend ‘’wedding tourism’’ in Turkey, Antalya. The Russian couple’s civil marriage was held by Mayor of Kemer Region. 37 year old groom Dimitry Ersov and 30 year old bride Olesya Voraniva had their dream wedding through professional international wedding planner Wedding City Antalya company. Wedding City Antalya’s center office is in Antalya, Turkey. Gülseren Özdemir, general manager of Wedding City Antalya company said that they are working with the ‘’Get married in heaven on earth Antalya’’ motto. She also mentioned that they are working with different countries from all over the world. Ozdemir said that they have started to enjoy the advantage of these works in a short time. She also mentioned that it becomes a trend to get married abroad and they made the first wedding of this year with a Russian couple. Their marriage was held by mayor of Kemer and the mayor also gave the couple Turkish coffee glasses as gifts. The couple became very happy because of this gesture. Ozdemir stated that wedding tourism sector develops more and more each day with the introductions. Ozdemir emphasizes wedding tourism’s importance in alternative tourism area. Foreign citizens usually prefer the countries which has beautiful and bright beaches and which has no long procedures for civil marriage. Ozdemir continued as ‘’ we should fasten the civil marriage procedures in turkey like our competitor countries which are making wedding tourism. Because wedding tourism new for turkey, official building processes for foreign grooms and brides should be fastened. Foreign country citizens do not prefer to get married in countries which require lots of documents for civil marriage. Culture and Tourism Ministry in Turkey and Antalya governorship supports wedding tourism in Antalya. our studies and introductions are continuing day by day for making Antalya one of the best destinations for weddings. Our enterprising wedding organization company prepares the foreign guests wedding in Turkey after the introductions and infrastructure studies by means of wedding tourism. Most of our wedding groups are coming from England, Europe, Iran, Lubnan, Russia, and Kazakhstan. Mrs. Gülseren Özdemir, the general manager of Wedding City Antalya company, mentioned that they are working with more than 1500 tourism agencies and these agencies introduce wedding tourism in Antalya on their web page. Ozdemir said that it is a trend to get married abroad in the world. Especially countries like Russia or north Europe are very cold countries. This is why Antalya has a big advantage because people in those countries choose warmer places to get married. Moreover, now people have started to understand that Antalya is not only consist of sand, sun and sea but also can be a very good place for weddings. Couples have started slowly getting married in Antalya, celebrating their anniversaries in Antalya and make celebrations for their marriage. Ozdemir said that the couples mostly choose to have a beach wedding. There are even some wedding couples who get married in between the waves. We prepare some themed wedding concepts for some couples. There are couples who are getting married on the yacht with pirate costumes, there are even some couples who wear traditional Turkish costumes and get married with Turkish traditions. We are organizing weddings like movies so they can remember that night for their whole life. We are introducing Antalya’s other face. Antalya will become a wedding city in the world soon. Gülseren Ozdemir continued; Iran, Russia, UK, USA and North Europe citizens are really interested in getting married in Antalya. for the first step, people want to believe that they can make their dreams real, and then if their budget is proper, Antalya can be their first choice. For couples it is an advantage to make both their weddings and their honeymoons or holidays together . Ozdemir emphasizes that the document preparation in Turkey lasts for 1 day when it takes 4-5 days in Europe countries. This is also a big advantage for turkey. Ozdemir said that in future wedding tourism will be much more attractive for couples and they are getting lots of orders even now. The couple who came to Antalya as a part of wedding tourism, made their wedding on yacht. Wedding tourism which becomes a trend in the world is developing also in Turkey. 28 year old Sergey and 24 year old Marina came to Antalya to have their wedding which is organized by international wedding operator wedding city Antalya Company. 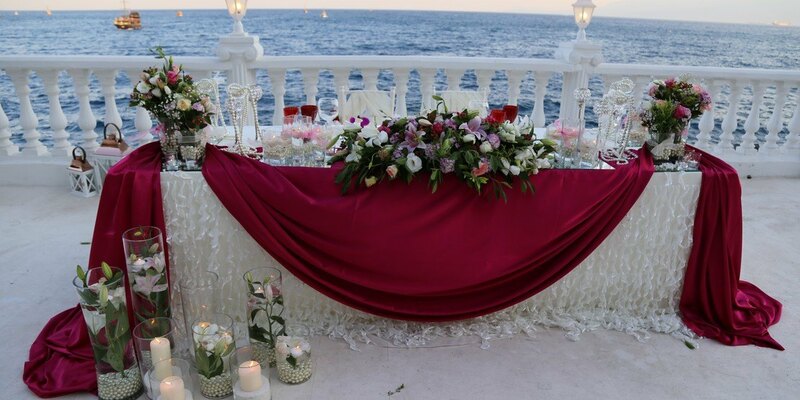 The couple informed the wedding city Antalya team that they want to have their dream wedding around blue Mediterranean Sea. Wedding City Antalya team arranged a pirate yacht for the couple from the Antalya yacht harbor. Couple came into the yacht through a red carpet and their marriage was held on the yacht. They made their first dance and they released doves as a symbol of happiness. Sergey Zhukov who had fun with his 10 relatives on the yacht said that Antalya is a unique city with its historical and natural beauties. Zhukov also mentioned that he came to Antalya for a holiday 8 years ago and fell in love with the city and this is why he decided to make his wedding in Antalya. Bride Marina Zhukov said that she is very happy to have her wedding in Antalya and she also informed that they also want to have their honeymoon here and planning to come back soon. Russian couple had their wedding in Antalya through the international wedding organizer company Wedding City Antalya. 37 year old groom Dimitri Ersov and 30 year old bride Olesya Voraniva had their dream wedding in Antalya. Their wedding was on the green area of a 5 star hotel. Bride came through bridal walkway with rose petals and their wedding was held by Kemer Mayor.